A tasty distinctive dark chocolate flavor is German Chocolate. This chocolate makes for a great cake. It is topped with a coconut pecan frosting and used for filling between layers too. You won’t want to miss trying this cake! Ever since I was little this has been my all time favorite cake. Between my grandmother and my mom making this cake; it was heavenly tasting! After my mom knew it was my favorite she’d make it for all my birthdays when I was growing up. She made it from scratch; home made by her hands. Even the coconut pecan frosting was homemade. It is the yummiest cake in the whole wide world! In reality my mom spoiled me with this cake and when the time came that her memory didn’t allow her to remember my birthday any more let alone make a cake, I was very sad. The year this happened I was working at a library. Virginia, the Head of Circulation, knew how sad I was and surprised me by making this cake. Everyone I worked with joined in and helped me celebrate. That’s a special memory that will stay with me forever. Now I usually make my own cake just not homemade but out of the box. It’s still good but not as tasty as the homemade kind. Do You Know What’s on June 11? 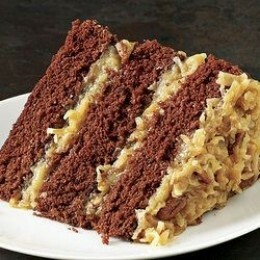 National German Chocolate Cake is June 11. How awesome is that? My birthday is in June and it’s my all time favorite cake! Sure wish it fell on my birthday but it doesn’t. My birthday is later in the month of June. 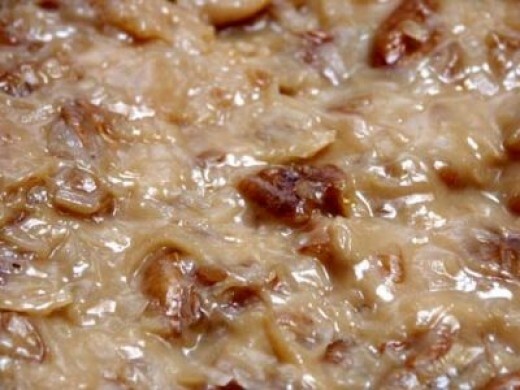 German Chocolate is a dark baking chocolate developed by Sam German. It was first made in 1857 for the Baker’s Chocolate Company. General Foods owned the Baker’s brand. It is not from Germany as the name may make you think that. It is American made. The first cake that was made with this chocolate was in 1957. The recipe debuted in Dallas Morning Star and created by Mrs. George Clay. 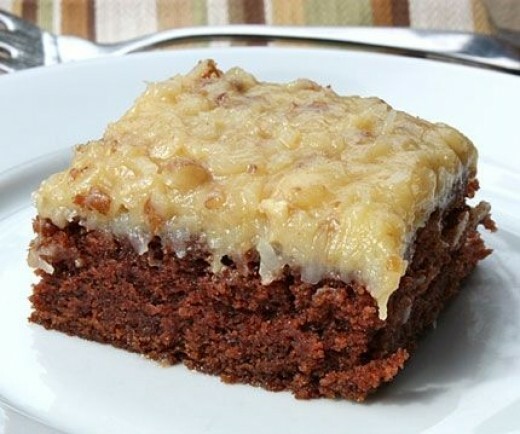 Since this time German Chocolate Cake is a popular favorite to many around the world. Is it German or Germans? It is said there was a misprint that the “s” was left off a recipe printed a newspaper article long time ago. So the word Germans became singular not plural any more; just German. Microwave chocolate and water in large microwaveable bowl on high for 1-1/2 to 2 minutes or until chocolate is almost melted. Remove and stir chocolate until completely smooth. Beat egg whites in small bowl with a mixer on high until stiff peaks form; set aside. Mix flour, baking soda and salt. Beat butter and sugar in large bowl with mixer until light and fluffy. Add egg yolks, 1 at a time, beating well after each. Blend in melted chocolate and vanilla. Add flour mixture alternately with buttermilk, beating until well blended after each addition. Add egg whites; stir gently until well blended. Prepare 3 round pans with waxed paper on bottoms. Spray sides with cooking spray. Then pour batter into pans. Bake for 30 minutes at 350. Take a toothpick and insert it in each center of the cakes; it should come out clean then cake is done. Immediately run small spatula around cakes in pans; cool cakes for 15 minutes; remove from pans to wire racks. Then cool completely. Spread Coconut-Pecan Filling and Frosting between cake layers and onto top of cake. Recipe is below. Beat egg yolks, milk and vanilla in saucepan with wire whisk until well blended. Add sugar and butter; cook on medium heat for about 12 minutes or until thickened and golden brown. Stir constantly then remove from heat. Add coconut and pecans; mix well. Cool to room temperature and of desired spreading consistency. Then frost and use for filling between layers. 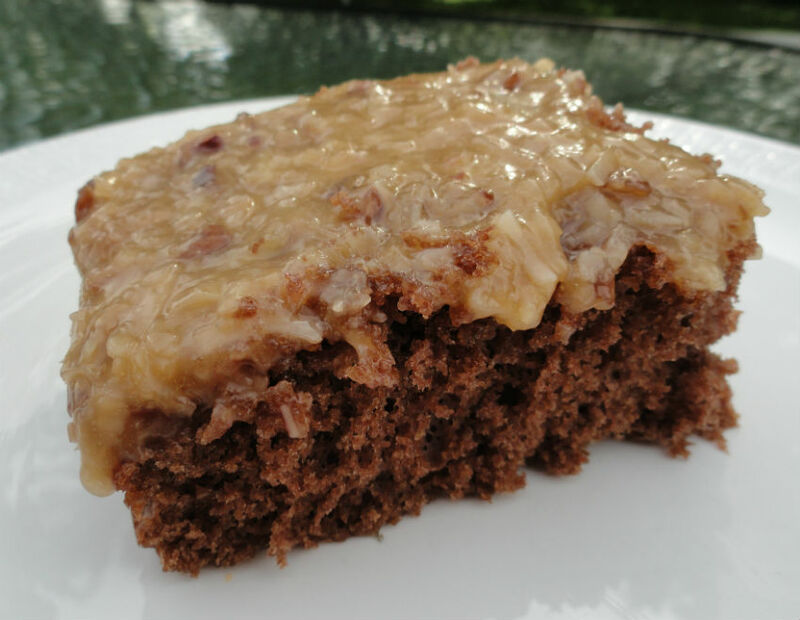 In this video you’ll learn how to make German Chocolate cake from scratch. It is a easy to follow step by step. I really like how the steps to baking this cake is described. Anybody can make one with these simple and easy to follow steps! Even though homemade is the best this is the easy way out of making this cake. Just use a box mix and already made frosting. You will need a few other ingredients as well like water, eggs and butter for the cake mix. It turns out very delicious cause I make it at least once a year; sometime twice. So grab your mixing bowls and utensils and get started!